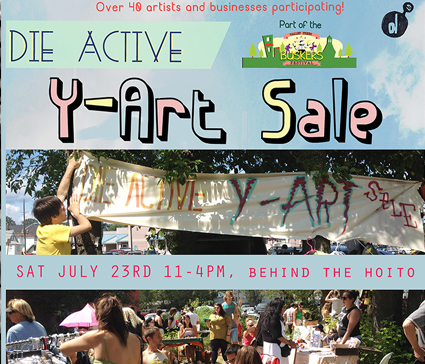 The event of the summer is back!DIE ACTIVE Y-ART SALE!! Behind the Hoito (111 Secord Street) in the ‘Midsummer Garden’Discover the unique works of young-blooded DieActive artists, clothing designers and crafters for sale – more than 40 vendors! Shop for original art & crafts, handmade jewellery, vintage clothing & treasures, zines, books, buttons, records and more. Plus, live music, lemonade, food trucks and all in the area — def a feel-good event, with all profits going to the artists!